As a previous floral importer, I have many fond memories of early mornings spent in Boston awaiting some of the most beautiful varieties of blooms from around the world. One delivery I always anticipated was our weekly shipment from Italy that would include boxes of deliciously scented petals, specifically freshly pruned mimosa. The electric yellow color of round balls hanging from the boughs of their dainty stems always made this such a treat and often we had a hard time keeping the product in stock for longer than an hour. Customers stood in line to purchase bundles of the intoxicating flora that brides across the city adamantly requested for their bridal bouquets. Although there is an increased allergen reaction due to it’s high content of pollen, mimosa not only makes a lovely additive to large floral arrangements but is also cherished because of its rich history. Originally, the plant was found to grow in Africa and Asia, preferring warmer climates as opposed to colder. As experimentalists, scientists and botanists took specimens and cultivated them in other parts of the world, the flower began to pop up in new areas such as Australia and even America (California). France soon joined the mimosa bandwagon and now can harvest this special variety in the hills and mountains of cities outside Nice. 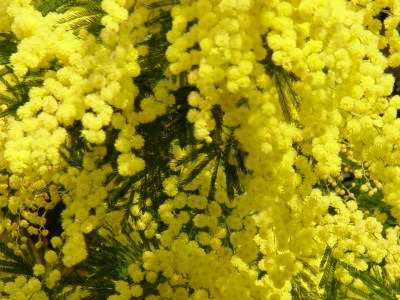 The French were so excited about their new native bloom that they made mimosa a permanent part of the celebratory decorations during parades and carnival events. Floats in particular are traditionally covered in yellow pompoms as a sign of joy and good luck sending a positive message to all spectators that attend. So what is the meaning of the mimosa flower? Funny enough, mimosa is tied to “sensibility” and is often connected to philosophers or problem solvers. It also means to literally “expand” your life whether referring to family, career or travel planning. 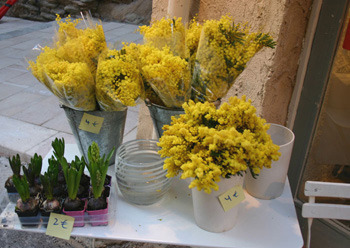 In other cultures, mimosa is tied to “sensitivity” and is given in small bouquets as a gesture of mourning or sympathy. Here in the states, the pretty yellow spheres have become symbolic as the official flower to “Women’s Day”.